Synopsis: William Penn was born on Oct. 14, 1644. He founded the Province of Pennsylvania. This became the U.S. state of Pennsylvania. His ideas inspired the United States Constitution. William Penn was born into a rich English family. He joined a religious group called the Quakers. He was 22 years old. The Quakers refused to bow or take off their hats to any man. The Quakers were not trusted. They were different and they refused to declare loyalty to the leaders of England. Penn was educated in England. From a young age, his religious beliefs separated him from others. He was kicked out of Oxford University in England for being a Quaker. He was arrested several times. Quakers were treated very badly. Penn decided he wanted to start a new Quaker community. It would be in North America. A Quaker community was started in 1677. It was in the area now called New Jersey. Penn wrote the rules for the community. They look much like the rules in the United States Constitution. When Penn's father died, King Charles II gave Penn some land. Charles did this because he owed Penn's father a lot of money. Penn called the area Sylvania. Sylvania means "woods" in Latin. King Charles changed it to Pennsylvania, after Penn's father. Perhaps the king was glad outsiders like the Quakers would live far away from England. Penn set up a government. It was democratic. Democracy is the opposite of having a king. In democracies, people have basic freedoms. For example, people in Pennsylvania had freedom of religion. Penn set up fair trials and elections. There was also a separation of powers. This stops one group from becoming too powerful. Each part of the government has some power. Power is spread out. These are all ideas that the American Constitution would later include. From 1682 to 1684, Penn lived in Pennsylvania. He made a treaty with the Native Americans. He bought land from them for a fair amount, instead of fighting them for it. 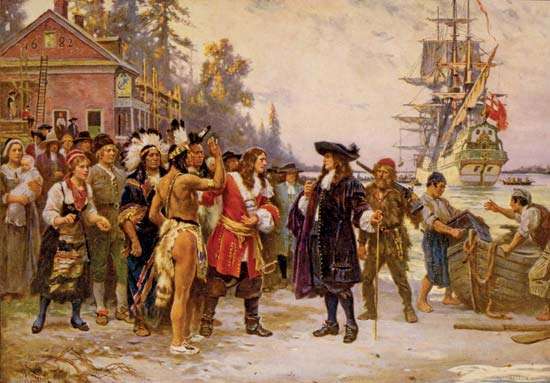 Penn treated Native Americans much better than other Europeans who came later. Penn's family owned Pennsylvania until the American Revolution. Penn died in 1718 at his home in England. Penn's memory has lived on. Ronald Reagan declared Penn an Honorary Citizen of the United States in 1984.